Frankness and sincerity are the hallmark of Mrs. Ronner and it is these qualities combined with a true artist’s temperament that made her renowned, and whose popularity will not likely fade any time soon. 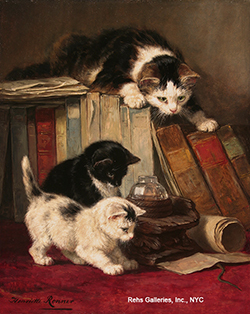 She was born Henriëtte Knip on May 31, 1821 in Amsterdam, the Netherlands into a family of artists. Her father, Josephus Augustus Knip (1777-1847) began working as a wallpaper painter in his father’s studio, and went to Paris, France, in 1801, where he produced mostly landscapes in gouache. After winning the Prize of Rome (1808) he spent a few years in Italy from 1809. There, he made numerous drawings of Roman monuments and landscapes in the Neo-classical style. In 1813, he went back to the Netherlands, before moving again in 1823 to Paris with his wife and two children, Augustus and Henriëtte. When Josephus returned four years later to the Netherlands, his eyesight began to fail, and he became totally blind in 1832. Even then, he moved within the Netherlands, first to The Hague then to Brabant, where he died in 1847. Around 1845 Henriëtte dedicated her works to animal scenes that depicted dogs, typically hunting dogs in forests and heath countryside. She began to receive critical praise at that time because of her “accomplished painting technique, balanced compositions and large formats.” (Kraaij, p. 1196) In the meantime, she met Teico Ronner whom she married in 1850, and since adopted the name of Henriëtte Ronner-Knip. That same year, they moved from Brabant to Brussels, Belgium, where she was to give birth to six children (two of them would become painters: Alfred Ronner 1852-1901, and Alice Ronner, 1857-1906), and to spend the rest of her life. Her first years of marriage were a struggle, as her husband was sickly, and she was once again responsible to provide the family income. Used to hard work, Henriëtte woke up regularly at five in the morning, and painted diligently to earn her family’s livelihood. Shortly after moving to Brussels, Henriëtte concentrated on painting images with dogcarts, which was a common means of transportation by the less well-to-do farmers and peddlers during the nineteenth century. These works evoked a Romantic influence, which is best reflected in one of her more popular works, Death of a Friend (1860, Museum of Fine Arts, Brussels). This painting, which measures eight feet by six feet, depicts an old sandseller weeping over the death of one of his dogs, still harnessed to the cart. This painting was highly acclaimed and as noted by E. Baes in 1887 “continued to be one of her most beautiful creations because maybe it reflects an era that is not so far away, yet absolutely different than the one we are obliged to live in.” (Baes, p. 187) After exhibiting this painting in Brussels in 1860, Henriëtte established her reputation as a dog painter, and subsequently received an increasing number of commissions from many distinguished patrons. Among them were the Kings of Hanover, Prussia, Portugal, and the Queen of Belgium as well as the Countess of Flanders who asked her to paint portraits of their dogs. Because cats were increasingly kept as house-pets, this subject became particularly popular among the art-buying urban middle class. 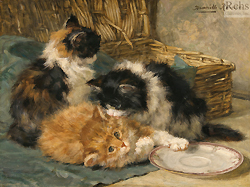 Thus, Henriëtte continued to produce a variety of scenes of sleepy cats and playful kittens in her usual dark colors. (Kraaij, p. 1196) In the 1880s and 1890s, her works came to include some of the popular motifs influenced by Japanese and Chinese art. As she increased her production of art works, Henriëtte also began making a water color or oil sketch for each painting in order to avoid repetition and detect forgeries. However, as modernism gained more prominence, her work began to be described as “uninspiring and conservative,” and these unfavorable remarks may have possibly led her to use a lighter palette, and move away from her carefully arranged compositions. (as noted by Kraaij, p. 1196) She died on March 2, 1909 in Brussels. During her illustrious career, Henriëtte Ronner-Knip exhibited widely and received numerous prestigious awards and honors. In 1850, she was elected as a Member of Merit of the Society “Artis Magistra” of Amsterdam. 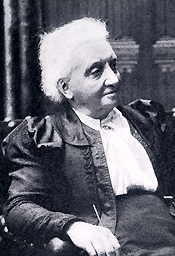 In 1857 she received the Silver Medal from The Hague, followed a year later by a Bronze Medal from Dijon, and in 1860 the Vermeil (silver-gilt) Medal at Troyes. In 1861, Henriëtte was awarded three medals, the Silver Medal at Metz, the Gold Medal at The Hague, and the Great Gold Medal at Lyons. Before the end of the following year, she was elected as a Member of Merit of the Academy of Painting and Drawing of Rotterdam. Then, in 1864, she received the Bronze Medal from Nancy, and the Silver Medal from Rouen. These were followed by the Gold Medal and Certificate of Honor at the Universal Exhibition of Oporto in 1865. Three years later, she received the Silver Medal from Havre and the Gold Medal from Amsterdam. In 1873, she was awarded the “Artistic Medal” at the Universal Exhibition of Vienna, and was presented with the “Unique Medal of Merit” by the King of Holland a year later. Other awards included the “Artistic Medal” at the Exhibition of Philadelphia in 1876, two Gold Medals from Antwerp and Amsterdam in 1879 and 1880 respectively. Amsterdam again awarded her the Gold Medal in 1883, and that year Edinburgh presented her with the Silver Medal. In 1887, she was awarded the Cross of the Order of Leopold II King of Belgium (Chevalier d’Lordre de Léopold), a rare honor for a woman to receive, and in 1909 she became Knight of the Order of Orange-Nassau, Netherlands.